Ever since I painted my tea box a light gray spray paint I have been obsessed with painting anything and everything that is not tied down in my apartment. Ok well that is a little bit of an exaggeration, but I feel like I've been outside in the back alley of my apartment spray painting alot lately. One thing I love about spray paint is how easy it is and how fast it is. One thing I hate is the limited colors and that its not so great for the environment, alright that was two things. 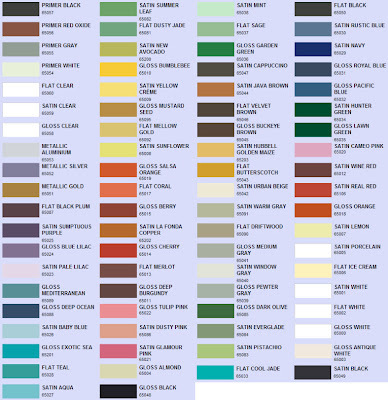 Speaking of colors I just found the amazing color choices that Valspar offers and I am blown away! 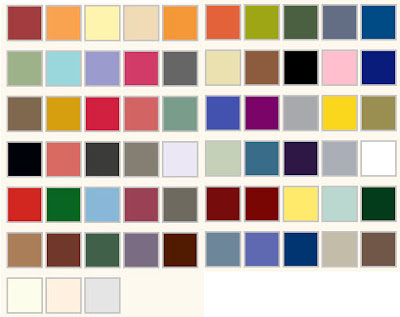 They don't carry it at my local Home Depot so I have not used it yet, but you better believe I will be heading to a local retailer soon to stock up on some of these fun colors. I can already count 10 or more colors I want to get. You better believe that my weekend will be full of spray paint fumes. And everything in my apartment will be covered in new bright colors. So, whats your favorite brand and color spray paint? do share. PS- a few of you asked and the color I used on my painted tea box was Krylon Pewter Gray. I love appliance epoxy. It's awesome and gives a great finish. I have just started down the path to a spray paint addiction myself! I just did a floor to ceiling art piece which involved some chrome 12x12 squares. LOVE! I love the Rustoleum / American Accents in Stone Gray!!! a great gray to add to your collection! Thank you for this! I've never used Krylon, but definitely will now that I see all the colors they offer. I'm on the hunt for a good mustard yellow.. wish me luck! I just painted some faux bamboo dining chairs Rustoleum's Night Tide - it's a great peacock blue. I love them! Love the silver and I have an old wooden desk I need to paint. i just can't decide between black or white. thoughts? oh, and orange is still your color. it totally scares me in anything more than a bit here and there!! a whopping 204 choices? seriously, you'll never look back ;) Since these are more of a flat finish, I take wipe-on poly to whatever I want to have a glossy finish (thank Jenny at LGN for the poly tip!). I bought mine thru Sam Flax store in ATL, just fyi. Allie, I saw that line but was not sure it would work the same on plastic, ceramic and wood. But if you say it works then I'm switching over right now. I mean 204 colors, woah!! thank you for the info, you are the best!! 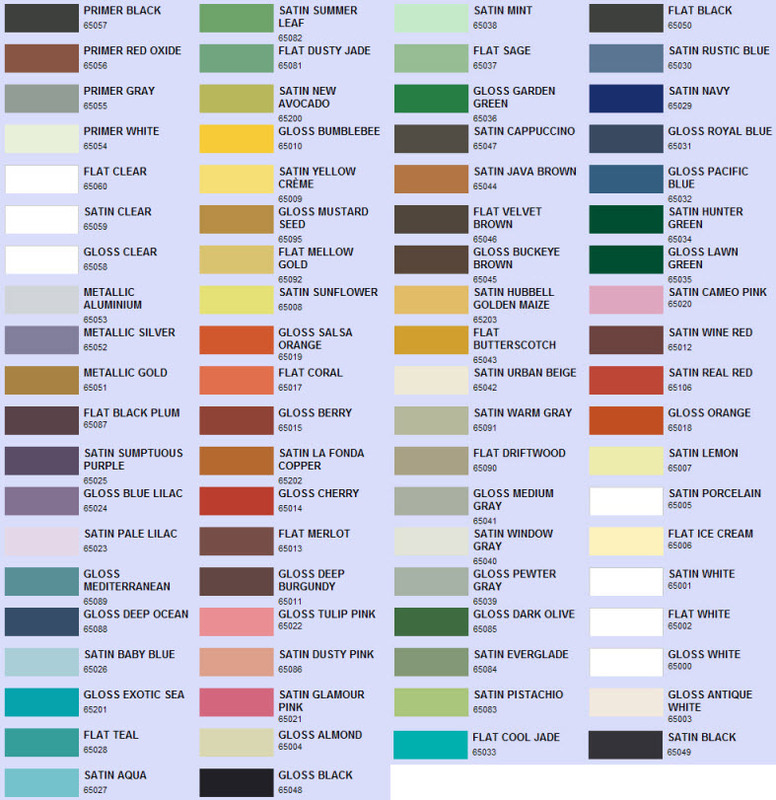 with such a great selection of colors, it is easy to want to paint everything in sight. i would just recommend getting a mask. in your painting frenzy i wouldn't want you to fry any precious brain cells. I'm a spray paint fanatic myself, so I'll chime in on this one. I'm a fan of Krylon. Great color choices and you can get it at Walmart! i bought a ... something!!! at an estate sale in minneapolis with the immediate thought that i would spraypaint it and add some scrapbook paper. it looks really similar to your teabox before the transformation, and i carried that sucker all the way back to atlanta! now I want to paint! I now have a bunch of things just off the top of my head I am dying to spraypaint! Have you seen the instrument that you pour paint into to spray, so that you can make any paint spray paint? I'm trying to remember where I saw it - I'll let you know when I find it! Wow! How did I miss this post with this gorgeous box?! You are a DIY diva! That came out amazing!!!! Might have to check some of these out. I love to spray paint--- as long as I have the attachable grip gun thing that keeps your pointer finger from getting sore/locked up! I'm a newbie to spray painting. Must I prime first? I went to my local DIY home place and the guy there insisted I didn't need to prime things before spray painting. What do you think? Amy, it depends on what you are spray painting. I am for sure no expert on this but for me things like raw wood that has never been painted before, or something with a crazy pattern or bright color priming might be a good idea.